Devall Towing & Boat Service is continuing to expand its fleet, having received the first of four new-build towboats, the Ryder James Devall, from Southwest Shipyard Brady Island. With high river on the Mississippi and Tombigbee rivers, the company paused only for a small ceremony with a priest blessing the Ryder James Devall, before sending the boat to help customers tame the raging currents. Its four-man crew will mostly work the Gulf Intracoastal Waterway when high river conditions subside. Ryder James Devall is the 12-year-old son of James “Jay” Devall, a third generation of Devall management who works in the barge department on operations and maintenance. Jay is the son of James “Bubba” Devall, and grandson of founder Alfred Devall. Devall Towing is now being “helmed” by its third generation and operating more than 100 barges and 35 towboats. Based in Southwest Louisiana in Hackberry, the company has 300 employees who operate four fleets and a diesel service division, and are a major provider of marine logistics not only on the Gulf Intracoastal Waterway, but also on the Mississippi River, its tributaries and the Gulf of Mexico. Since the 1960s, the company has been providing marine logistical services for hazardous chemicals. “We specialize in this service and help our customers with highly advanced equipment built for their product,” said Matt Devall, chief financial officer. “We are a proud member of AWO and are RCP (Responsible Carrier Program) compliant,” adding the Capt. Al Devall obtained the company’s first Certificate of Inspection from the Coast Guard’s Marine Safety Unit in Lake Charles, La. In 1952, Alfred Alcide Devall purchased three wooden hulled towboats for a total of $12,000 and “so humbly began Devall Towing & Boat Service,” Devall explained. The company initially worked in the oil patch, but in the 1960s, it began pushing tank barges carrying petrochemicals. Since that time, the company has successfully focused on servicing that industry, Devall said. Alfred’s sons—Mike, Claude, Joe, Bubba and Allen—began “helming the company in 1983, growing the company by towing their customers’ barges on the Intracoastal Waterways,” he continued. In 2004, another opportunity arose and the brothers purchased 12 of their customers’ barges. It was the beginning of their successful barge ownership and fleeting business. Measuring 64 by 27 by 10 feet, the 1,500 hp. Ryder James Devall is powered by Tier 3 Cummins QSK-19 engines supplied by family-owned Devall Diesel Service. 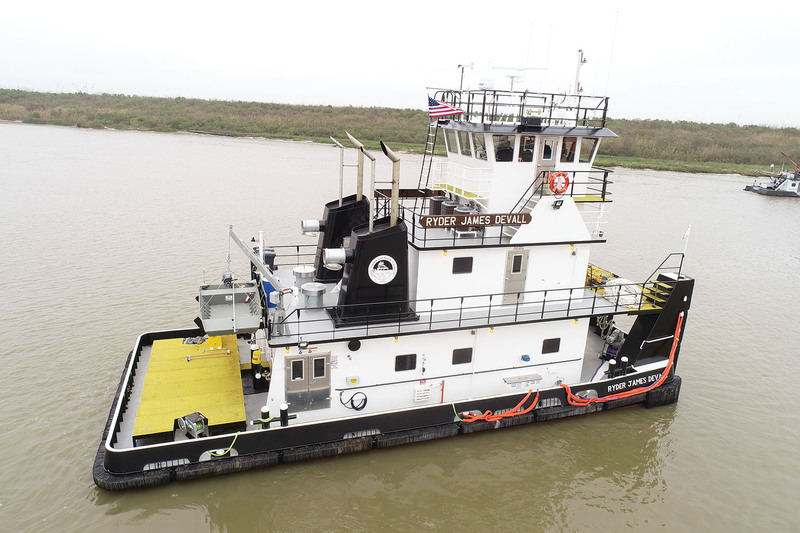 Sound propellers from Texas Wheelworks of Port Arthur, Texas, are powered through Twin Disc MG 5222 gearboxes from Sewart Service with a 7:1 ratio and 6-inch Aqua Met17 shafts from Crumpler’s Machine Shop in Bridge City, Texas. Dale’s Welding provided the aluminum exterior doors, windows and pilothouse windows, while the electronics package was supplied by D&G Electronics. Firefighting is a product of Hiller, while Custom Hydraulics built the hydraulic steering. Winches are Patterson 40-ton electric and chocks are Nabrico DF-460-3 along with Nabrico DF-192 6-inch buttons. Two John Deere 4045TFM Tier 3 engines, also supplied by Devall Diesel Services, provide auxiliary power through Stamford 65 kw. generator units. Interior paneling is FRP with half-inch plywood backing. Cabinets are birch plywood and solid red oak. The red oak was also used in interior trim and interior joiner doors. Mineral wool sound insulation was used extensively. Flooring is PCS Epoxy. Bunks were supplied by Schuyler Maritime. The galley sink is double-deep stainless steel while showers are cultured marble. The galley countertops and pilothouse dash console are granite, installed by Kon’s Marine Fabricating. Devall used Carboline for interior and exterior paint, including the zinc undercoating. To protect against electrolysis, 50 zinc anodes, each weighing 24 pounds, were installed. In the engineroom, decks and stairways use steel diamond tread plate. Fresh water pressure is through two Grundfos MQ sets. 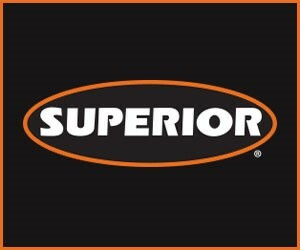 Air compressors are Quincy 325. Sewage system is Sea Horse; fire pump is MP Model 36301 2×2 inch; and two bilge pumps are Barnes model #5CU-1. To move air for the engines, the engineroom has 24-inch intake blowers and 18-inch exhaust blowers. A Rio Marine switch panel was installed by Trinity Power systems with armor coating shipboard cable. McDermott LED floodlights and Phoenix deck lights were installed on the exterior and Halo Can lights were chosen for interior fixtures with Pauline stateroom reading lights. Navigation lights are McDermott and searchlights are Carlisle & Finch 19- and 15-inch. Rio Marine installed the navigation light panel, fire detection and general alarm. Liquid capacities include: 10,000 gallons fuel, 321 gallons engine oil, 640 gallons slop oil, 321 gallons gear oil, and 4,000 gallons fresh/potable water. The architect for the new-build series was Glen Ring with Advanced Fabrication. Project engineer was Raymond Butler. The company expects to take delivery of the Velle Devall in May, Anna Francis in October and Kathryn Louise in early 2020.